Remember that fabulous dinner last night? Well? It didn’t agree with me so I had a bad night. Good thing I had the room to myself. I am wondering if the strange (to me) mushrooms on the veggie platter were a problem. Even though I’ve been trying to push ahead before the rain comes, and today was an excellent day for walking, all I wanted to do was lie down and close my eyes. The prospects for intermediate stops are poor at this time of year, and 25 km seemed too much under the circumstances. 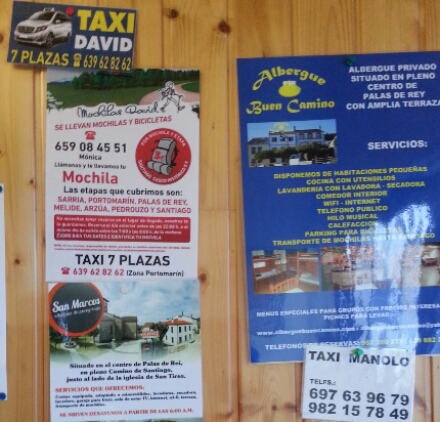 I cast an eye at the bulletin board with its tempting offers of taxis and backpack transport. Instead I packed up my stuff and headed uphill at 9 a.m. in search of the Hotel Pousada de Portomarin. They had a room and by 10 a.m. I was comfy in bed. 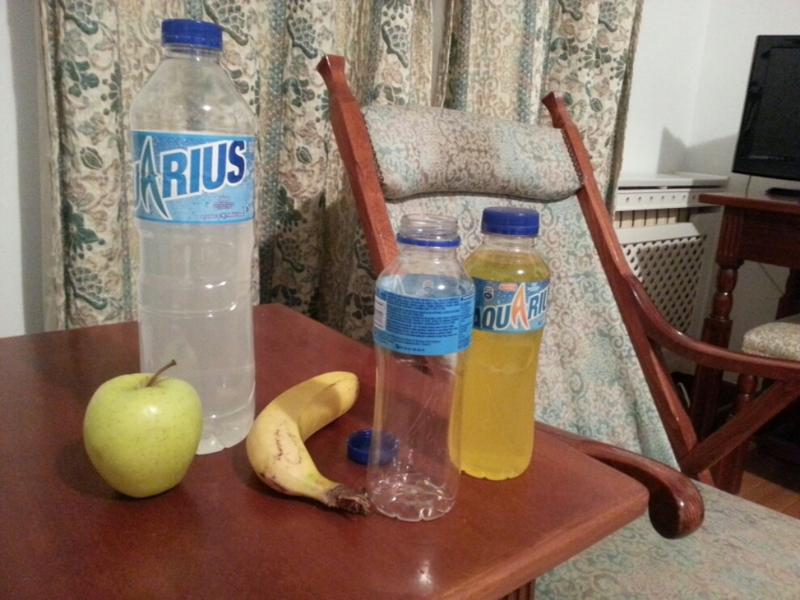 I slept a few hours, went for a little walk to buy sports drink, bananas and an apple. No greasy pilgrim dinner for me tonight! And no vino tinto either! As you can see, this pilgriming is not always a barrel of fun. (I know. Most of you were already convinced of that, which is why you are at home reading, instead of being here.) But I’m feeling much better now and expect to be walking tomorrow. But I did need a rest day! Only 4-5 more days to Santiago. November 20, 2015 in Camino 2015. Hang in there, I am also resting today……. Oh no! I was going to comment on your last post, saying that I had pretty much the same plate of grilled veggies in Portomarin, but I don’t think I had the mushrooms, phew. So sorry to hear that you’re under the weather, but it sounds like the day of rest was just what you needed. Good luck in the final stretch to Santiago! I suspect my body was just saying “enough” to the pilgrim diet. I’m feeling fine today. A really nice place to stay short of Palas de Rei is Rectoral de Lestedo, an upmarket converted rectory. It is after Eirexe and A Calzada and before Valos. Tel 982 153 435. Nice dinner, log fire, lovely rooms. Thanks. I’ve noted that and will see how the day goes. A lot of places are closed now but I can call and check. Yes it looked nice, but closed. However we made it to Palas de Rei.